comets are small bodies (usually 1 billionth mass of earth) that orbit around the sun, the far majority are too faint to see with the naked eye, but every 5-10yrs or so a naked eye comet arrives. The old-style system gave the year of perihelion passage and the Roman numeral specified the order of perihelion passage during that year. Hence, 1970 II was the second comet to pass perihelion in 1970.
the solid, centrally located part of the comet is known as the "nucleus". The nucleus is a repository of dust and frozen gases. When heated by the sun, the gases sublimate and produce an atmosphere surrounding the nucleus known as the coma which is later swept into the elongated tail. he sizes of cometary nuclei are mostly unknown because the measurement is a difficult one. We have reliable measurements of the sizes of about 10 nuclei. Most of them have diameters from a few km to 10 or 20 km. The nucleus of comet Schwassmann-Wachmann 1 is probably one of the largest (perhaps 20 km), as is the nucleus of comet Hale-Bopp (perhaps 40 km). Except in the special cases of comets Halley and Borrelly, whose potato-shaped nuclei were resolved by the cameras of passing spacecraft, the sizes are inferred. The composition of the nucleus is determined by measuring the composition of the coma. We know nothing directly about the internal structure. The dominant volatile is water, followed by CO, CO2 and a host of minor species present at the <1% level. There is some evidence for abundance variations among comets. The CO/H2O ratio reached 0.2 to 0.3 in Hale-Bopp but is typically 4 or 5 times smaller. The ratio of volatile mass to refractory mass is probably near 1.
most have no tails, but some, as they approach the sun, develop a tail - actually a gas tail and a dust tail - both of which are always directed away from the sun due to the "solar wind"
tail of Halley's comet in 1910 grew at rate of 500,000miles/day until it reached 90 million miles long. The heliocentric distance (r) is much more important than the geocentric distance (delta) in terms of how bright a comet gets. m0=absolute magnitude of comet ie how bright the comet will appear if placed 1AU from sun and 1AU from earth. n=rate of brightening. The higher the value of n, the more rapid the brightening. 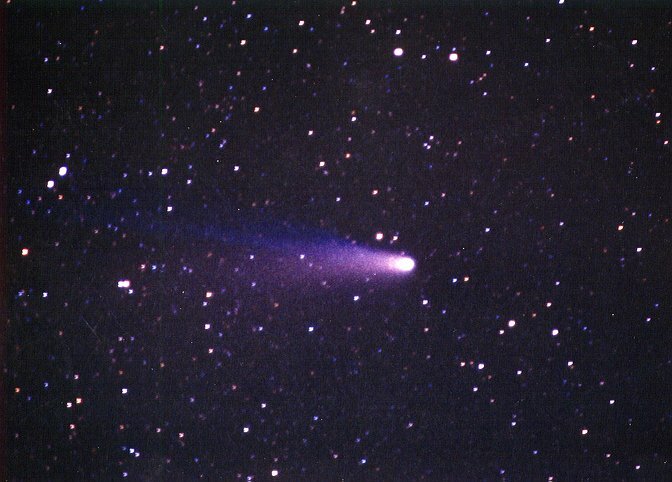 The average comet has n=4. First time comets tend to have n=3-4 whilst periodic comets tend to have n>4. first, the nuclei are losing mass at rates that cannot be sustained for very long. For example, a 5 km radius spherical nucleus would have a mass about 4x1015 kg. When near the sun, this nucleus might sublimate at 10^4 kg/s (10 tonnes per second), so the sublimation lifetime is 4x1011 s = 1000 years. True, the comet might spend only part of each orbit near the sun, and so might be able to keep going for more than 1000 years, but it is simply unable to sustain mass-loss for the 4.5x109 year age of the solar system. second, the active comets are under the gravitational control of the planets. There is a finite chance that a comet will be either ejected from the solar system, injected to the sun, or absorbed by an impact with one of the planets (as happened in the famous case of Shoemaker-Levy 9 hitting Jupiter). 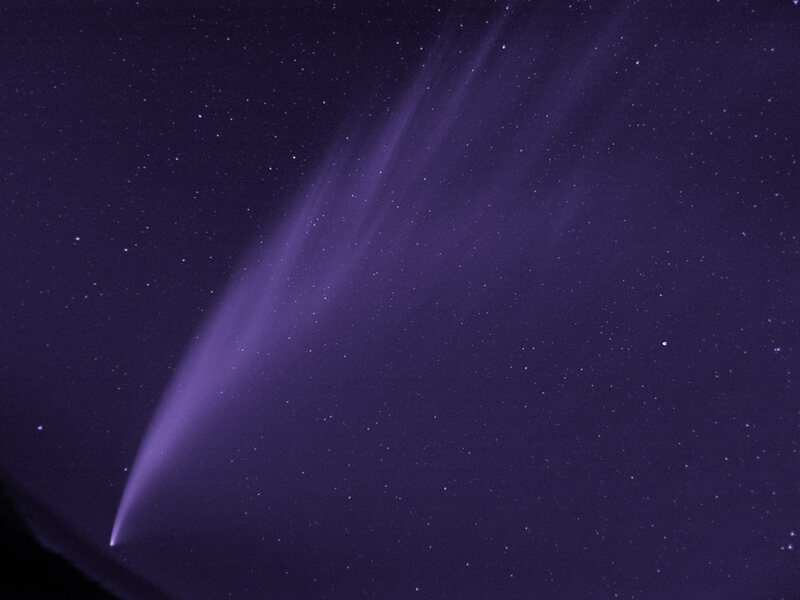 The "dynamical" lifetime of a typical comet is about 0.5 million years. given that the comets we see now cannot have been present in the inner solar system for more than a million years or so, we have two choices. Perhaps the comets are young, meaning that they are created somewhere and then dumped in the inner solar system where they become active and are discovered. The trouble with this is that we do not see any place in the solar system where comets could be formed at the present time. So, it seems more reasonable that the comets were formed with the rest of the solar system and have been stored since formation in a cold place where the nuclear ices would be stable. The two deep-freeze locations now under discussion are Oort Cloud and the Kuiper Belt. early astronomers generally regarded comets as atmospheric phemonena, a kind of exhalation of the earth and many regarded them as signs or omens of fortune - good or bad. the notion that they lay beyond the moon was not developed until Tycho Brahe studied the comet of 1577 which he believed must move in a circular path outside the orbit of Venus. His student Kepler, believed they moved in straight lines. the problem was resolved by Edmund Halley (see Halley's comet). most comets can be relatively easily photographed when they reach magnitude 8-9 or brighter although results will be very much dependent on light pollution and your ability to take guided images. a common setup is to piggyback mount a camera on a motorised telescope which is then used to track the comet, and in separate images to track the stars as the comet will slowly move in relation to the stars. you usually will need a good quality lens or telescope with effective focal length in 35mm terms of 200-400mm and aperture f/5.6 or brighter. use a median combine of the comet images with alignment on the comet nucleus (eg. Images Plus Sigma Clip Median) to produce the comet image and this will remove star trails, jet and satellite streaks. you should be able to get away with using a tripod and exposures of 5 to 20secs at f/2, 400ISO, although to register the dimmer parts of the tail, you may need to resort to the technique for comets magnitude 4 to 9.
may be able to get away with a short exposure of 1/30th to 1/200th of a sec. the main problem is ensuring you are focused at infinity and the lack of contrast with the twilight sky requiring some adjustment of curves in PS. although not visible to the naked eye, a 10" telescope may show it (take great care not to allow the telescope to include the sun in its field of view or immediate permanent blindness may result as well as cracking of eyepiece glass from the heat). may need to stack perhaps 10 images taken at prime focus on a 10" f/5.6 scope taken at 100ISO and about 1/100th to 1/4000th sec depending on brightness. only the brightest parts of the tail will be able to be photographed in daylight. unexpectedly suddenly became brighter with an expanding halo some 7x the size of Jupiter with it being about 600x further than the moon yet appearing almost half the size of the moon but with no significant tail evident. the 2nd brightest comet in about 100 yrs, reached magnitude minus 5.5 and was able to be photographed in daylight through a 10" telescope. Two fragments of the disintegrating comet were visible in binoculars and small scopes at about 6th or 7th magnitude, a third was in reach of larger amateur scopes — and about 65 much fainter pieces have been detected. All are strung in a line, making their closest pass by Earth May 14–17 at a distance of just 10 million kilometers (6 million miles). English astronomer Edmund Halley (1656-1742) finally resolved that comets were orbiting the sun consistent with Newton's newly propounded law of gravitation. He calculated orbits for 24 of the brighter comets & noted the striking similarity between the orbits of the comets of 1531, 1607 & 1682. He predicted that these were the same comet and that it would return in 1758-59 but died before his prophecy was fulfilled. it has a period of 77yrs, having been recorded as having returned as far back as the 5thC BC. it is due to return in 2063. NB. this list was sent to an astronomy forum thread, not sure where it was derived from. An unexpected increase in brightness over a short period of time due to the release of dust and gas into the coma from the nucleus. For a visual observer, the nuclear condensation (a bright spot near the center of the coma) will appear to become star-like and brighter in the comet's coma. Over time (hours - days), the size of the nuclear condensation will increase as the dust moves away from the nucleus. The change in brightness can be as little as half a magnitude and as much as many magnitudes. The point in a comet's orbit that it is closest to the Sun. 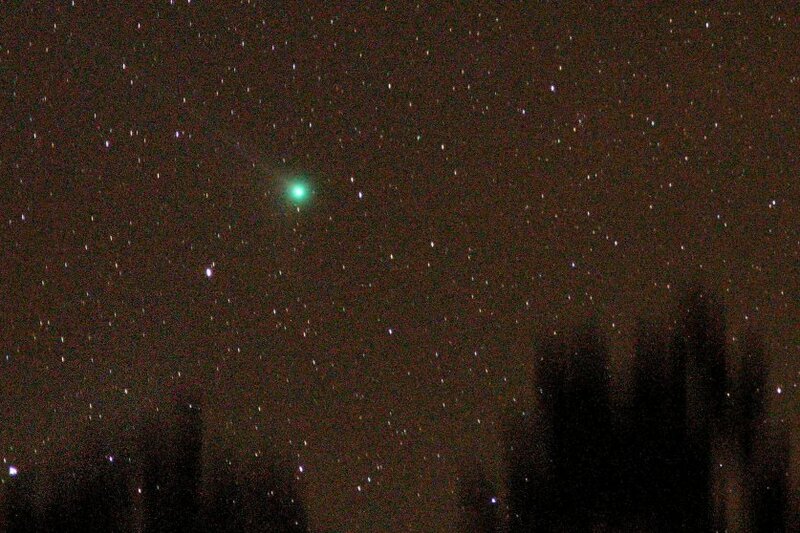 The date (and time) the comet reaches perihelion. The comet's distance from the Sun, usually expressed in Astronomical Units, at perihelion.